This week’s prompt was to write about a colour (the secondary prompt was going back and changing one thing in your past but I think that’ll be a story for another day). I dream the colour purple; landscapes made purple by the light of dusk and dawn. I wish I could live always in one of them, in the shadow times. There is purple in the way the ocean swells in a sunset storm. It’s there in the backlight you see in the sky right before a lightning strike. You found it frightening but the colour speaks to me like no other. I dream the colour purple. We walked through a field of lavender and you made some remark on the smell, ignoring the colour spreading from our feet all the way to the horizon. How could you not want to wrap yourself in it? You were even less impressed by the vineyard, when we stopped to taste the sweet, warm burst of flavour from grapes fattening on the vine in the summer heat. I dream the colour purple. The purple-hued circles under your eyes were beautiful to me. Makeup could only partially disguise them; I don’t know why you tried. Even more beautiful was the colour of the bruises you wore from a punishment done just right. I dream the colour purple. The piercing hue of the amethysts we found when I took you rock hunting; the wonder of finding a geode with its hidden treasure. It was our last outing together. You never should have tried to run. I dream the colour purple. It was the colour of your eyes – just like Elizabeth Taylor’s. I always loved your eyes. It was the only thing I loved about you which is why I plucked them out to add to my collection. I dream the colour purple. It is the colour of royalty to some, of death to others. You didn’t understand my love of purple, but you do now. It is the colour of your corpse as it lies cooling at my feet. I dream the colour purple. 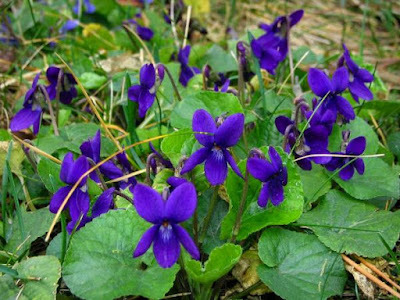 There is a carpet of violets, deep in the heart of the dark wood. Your final resting place; you and others like you. Rest easy, knowing you will feed the colour purple. And my dreams.